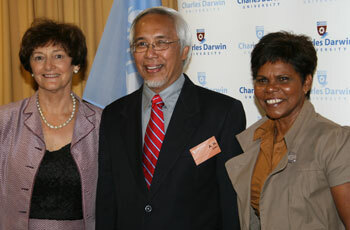 Charles Darwin University has advanced its role as a key location for working with Indigenous people and enhancing the broader understanding of and training in Indigenous Knowledge as a result of the recent United Nations University (UNU) Institute of Advanced Studies (IAS) Centre of Traditional Knowledge launch. The Centre, which has been supported and warmly welcomed by the Northern Territory Government, was launched by the Director of the UNU-IAS, Professor A.H. Zakri on Wednesday, 12 December. The Deputy Chief Minister, Marion Scrymgour said the Government was pleased to have committed $2.5 million to the Centre to further develop the Northern Territory’s knowledge-based industries.